The micromanipulation device is finding largest application in the healthcare sector. IVF, transgenics, and electrophysiology fields. With the help of micromanipulation, various advanced techniques are being performed. There has been an increase in the adoption of various treatments owing to the increase in male infertility. Also, the new avenues for research and development activities have opened up in the fields of cell biology and neurology. Companies are also focusing on developing a variety of probe positioners to meet personal preferences and application demand. 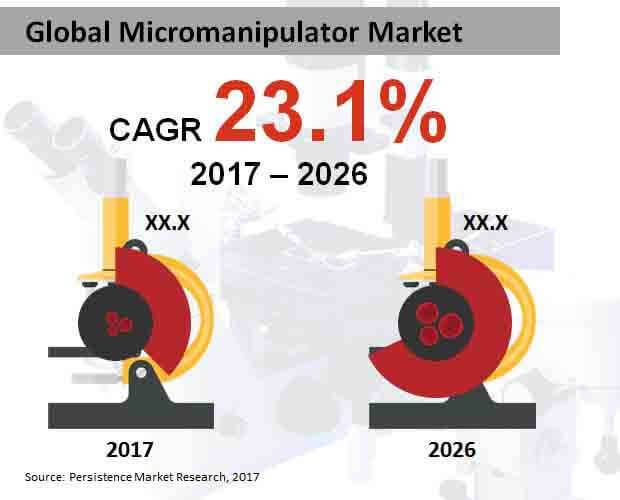 By using technically advanced procedures and methods, manufacturers are trying to offer micromanipulator devices at a better price. With the increasing application of laser medical equipment, researchers are focusing on improving the quality and reliability of laser micromanipulators. This is being done to make it suitable for ears, throat and other parts for minimally invasive procedures. Meanwhile, the rising need to perform delicate manipulation of a specimen is also resulting in the development of precision micromanipulators such as cutting tools, injectors, and pipettes. Leading companies are also modifying microscope design owing to the increasing use of micromanipulators. In the recent years, the technique of optical tweezers has also evolved as an alternative to the mechanical methods of the micromanipulation. Electric micromanipulators are likely to emerge as one of the top-selling products between 2017 and 2026. By 2026 end, micromanipulators are estimated to exceed US$ 200 million revenue. The growth of electric micromanipulators is attributed to enhance precision in movement, high accuracy, and convenience. This is also resulting in the increasing adoption across a wide range of applications. Compared to research laboratories & diagnostic centers, hospitals are likely to emerge as the largest end users of micromanipulators. Hospitals are estimated to create an incremental opportunity of nearly US$ 200 million between 2017 and 2026. Increasing investment by public and private sector organizations for the development of hospitals with advanced treatment facilities and increasing number of patients suffering from infertility are some of the factors driving the use of micromanipulators at hospitals. Micromanipulation is anticipated to find the largest application in cell micromanipulation during 2017-2026. Towards 2026 end, cell micromanipulation is estimated to exceed US$ 300 million in terms of revenue. Micromanipulation is largely used in cell micromanipulation. Under cell micromanipulation, intra-cytoplasmic sperm injection (ICSI) is offered to patients on a large scale. ICSI is the micromanipulation technique that can help to overcome a severe form of male infertility and is mostly used when standard IVF fails to give any positive results. North America is likely to remain dominant in the global micromanipulation market. Owing to the high awareness among consumers about the application of micromanipulation device, increasing investment by the government and private sector firms to introduce advanced technology for treatment. These are some of the major factors contributing towards the growth of micromanipulation market in North America. Meanwhile, Asia Pacific Excluding Japan (APEJ) is also likely to show significant growth in the coming years. Some of the leading companies in the global market for micromanipulators are Eppendorf AG, World Precision Instruments Inc., Applied Scientific Instrumentation Inc., Narishige Co. Ltd., The Micromanipulator Company, Danaher Corporation, Siskiyou Corporation, Scientifica Ltd, Luigs & Neumann, and Sensapex Oy.